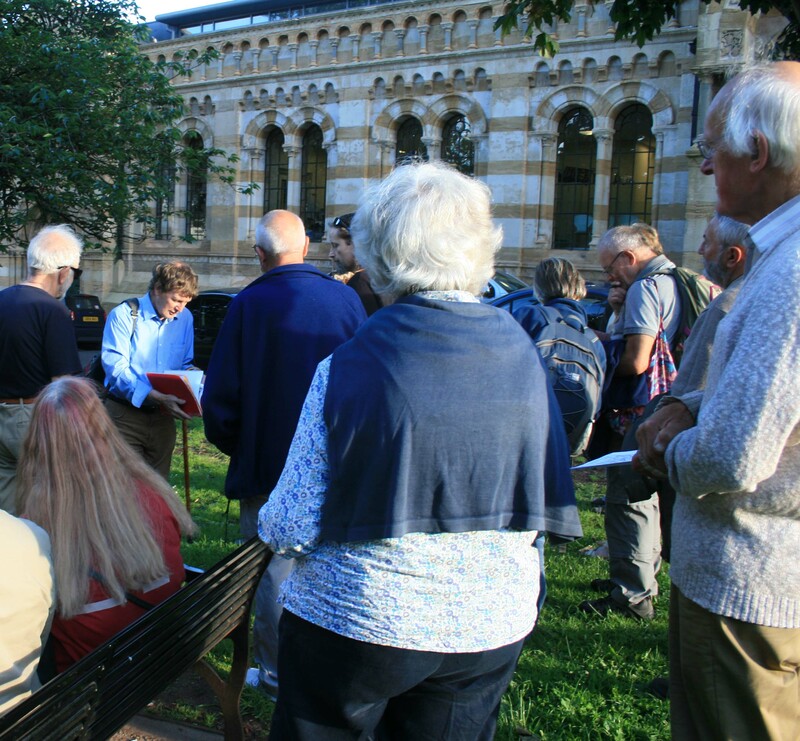 We met at Park Place for the start of the walk and 18 people came to hear James talk about Old Clifton. 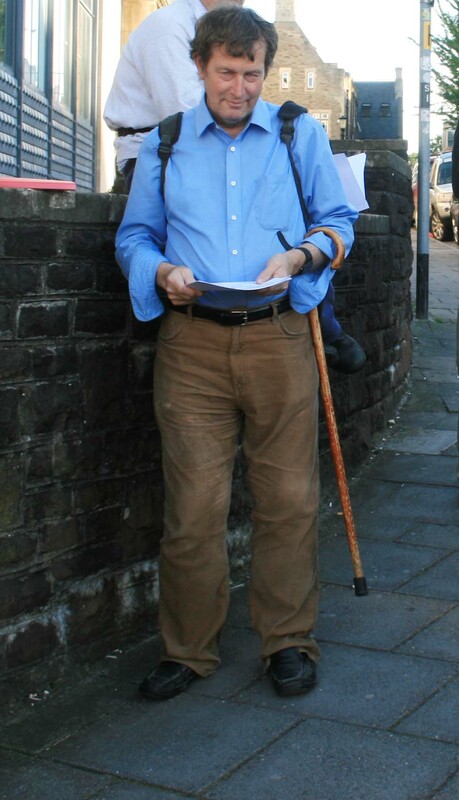 He gave a brief summary of the origins of Clifton starting with King Alfred framing the boundary of the land in 883 which included 2 earthworks at the Iron Age fort of Clifton Down and the Iron Age/Roman field system on Clifton Down between the Zoo and Ladies Mile. 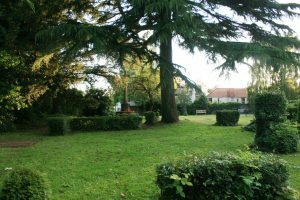 By the Medieval period it was centred around Clifton Green and Cliftonwood covered 100 acres with Rownham Mead being meadowland. In 1645 by the time of the Civil War Prince Rupert adopted a ‘scorched earth’ policy which destroyed much habitation. However, by the 1730s visitors came to the summer resort at Hotwells to take the waters, but this fell out of favour when people began to die afterwards! By the 1740s around the village green substantial houses began to be built and by the 1790s there was building up to the gorge by the Suspension Bridge (but not yet built). The Tyndall’s Park Estate ran from the west of Queen’s Road (from Habitat). Beyond this area marginalised activities took place. The RWA was enhanced by the Wills family who put in a marble hall. The Green at Park Place where the walk began had its terrace built in the 1820s and the Pro-Cathedral building began in 1834 with a classical design of baroque splendours. Unfortunately it subsided and in 1847 it was sold for £2500. 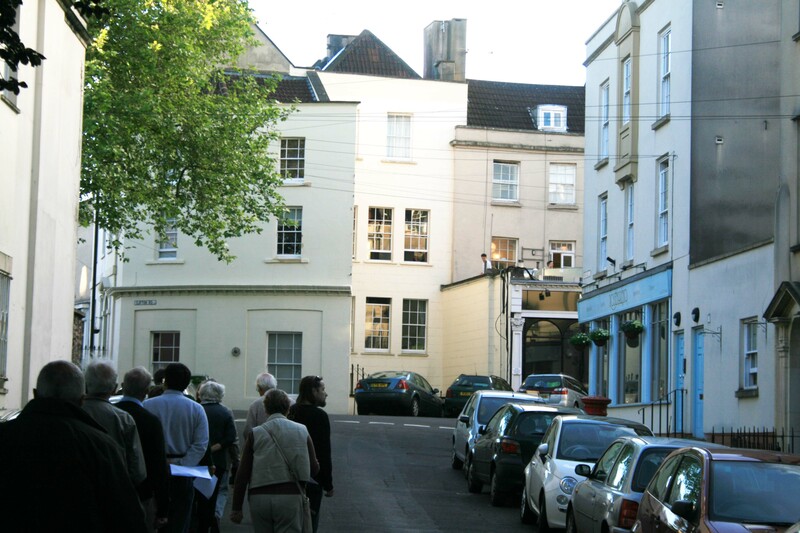 We then walked to Wetherell Place, named in the 1820’s after the reactionary judge and MP, Sir Charles Wetherell, whose visit to Bristol in October 1831 sparked off the notorious Bristol Riots. The fine gothic revival house on the corner was built for his own use in 1860 by the architect Joseph Aloysius Hansom, inventor of the hansom cab. House of Joseph Hansom in Wetherell Place. We moved on up through Dover Place and Tottenham Place to Manor Hall. Here there were two manor houses one of which was bought by the Merchant Venturers. The question to be asked is where is the original manorial centre? It is probably at the junction of Clifton Road and York Place. Here a manorial court was held and from here to St. Andrews church was an entire manorial complex. The junction of Clifton Road and York Place at the site of the manorial centre. We arrived at Clifton Green which is the site of the original parish church first mentioned in 1272. The church was remodelled in 1654, probably after damage by Prince Rupert, and again in 1714 and 1763, before being demolished in 1822 and replaced by a new church on an adjacent site. At the same time the nearby “Church House”, used latterly as a poor house, was demolished and replaced by the present churchyard gateway. After the new church was built the pews were rented out at vast cost, to keep out the rabble. The new church was sadly bombed in the Blitz of 1940 and completely gutted by fire. 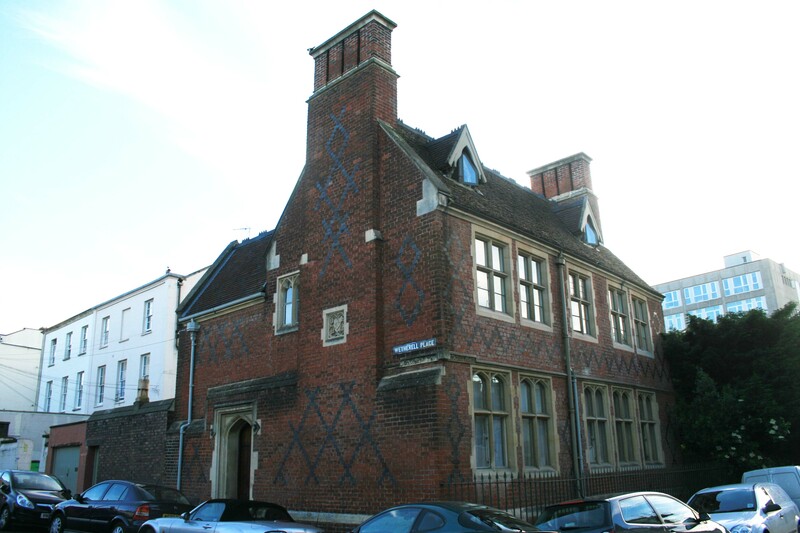 It was finally demolished in 1954 at the insistence of the then Bishop of Bristol, Bishop Cockin, who lived next door. We then followed the covered walkway through the later cemetery which is generally known as the “Birdcage Walk”. 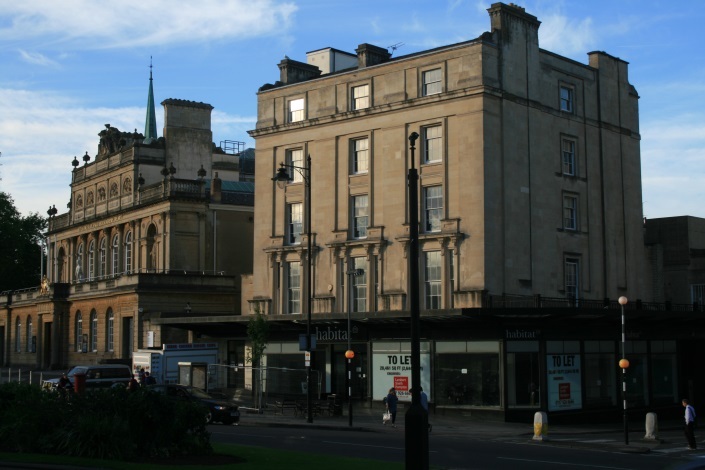 However we were told that the real “Birdcage Walk” was the nearby path running through Victoria Square, which until World War II was flanked by high iron railings. Clifton Green, the site of the original St Andrews Church (1272). Here lies a poetess Mary Yearsley (died 1806) who was taken under the wing of Hannah More who published her poetry and secured funds. Unfortunately, they had a disagreement and Mrs. Yearsley cut her losses and continued alone, with the funds. We ended by walking past the elaborate Buckingham Chapel and Buckingham Place, both built in the 1840’s on the site of a nursery garden operated by Joseph Curtin between 1825 and 1838 (one of many nurseries in Clifton at the time). The walk finished by the junction with Pembroke Road, a very old route leading up to the Downs and originally called “Millmote Lane”. A big thank you to James for such an interesting talk and walk. We all learned something, even those of us who regularly walk the route, with no idea that it held such interesting history. Report by Paula Gardiner (with some help from James!) 16.6.14.